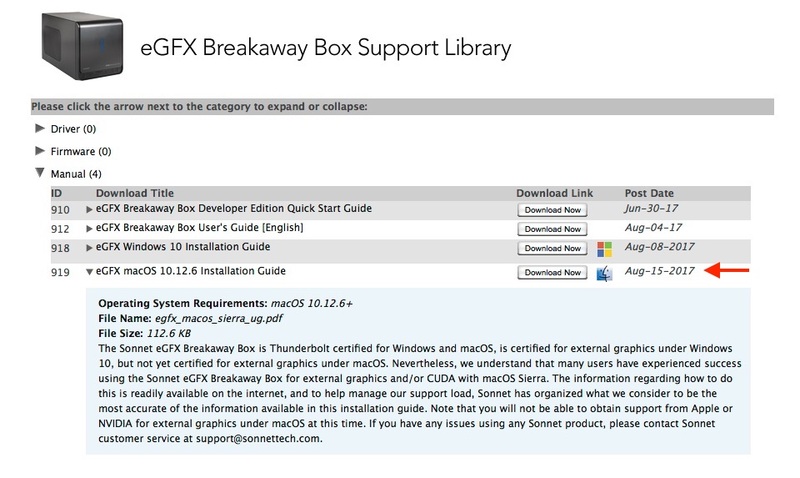 Sonnet、Appleの開発キットにも採用された「eGFX Breakaway Box」でNVIDIAのGPUをmacOS Sierraで利用する方法を公開。 | AAPL Ch. The Sonnet eGFX Breakaway Box is Thunderbolt certified for Windows and macOS, is certified for external graphics under Windows 10, but not yet certified for external graphics under macOS. Nevertheless, we understand that many users have experienced success using the Sonnet eGFX Breakaway Box for external graphics and/or CUDA with macOS Sierra. […]Note that you will not be able to obtain support from Apple or NVIDIA for external graphics under macOS at this time.